We are one of the most preferred and reliable Manufacturers, Exporters and Suppliers of Permanent Magnetic Tubes & Grids. We have been catering to the requirements of various industries and sectors by offering precisely designed and developed Permanent Magnetic Tubes & Grids. Our dexterous team members make sure that the Permanent Magnetic Tubes & Grids is manufactured as per the customers’ exact specification. Our Erich Permanent Magnetic Tubes & Grids are used for removing fine and general tramp iron to protect a product from metal contamination. 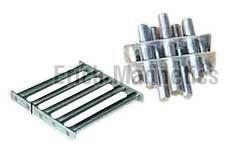 Grid magnets are manufactured from ceramic or rare earth magnetic tubes. These are installed in hoppers, chutes and ducts to benefit mainly food processing and ceramic industry. Our grids are available in a range of housings to meet the customer's individual requirements. Optionally a grid can be constructed with an automatic pneumatic cleaning device reducing downtime. Grids that we offer can be provided in any shapes and sizes and are simply placed in the hopper to rest against the sides, thus allowing the materials to flow through the grid. Two styles of magnetic grids are available in round and rectangular/ square. Both of these are constructed using stainless steel with 1" diameter magnetic tubes. Rare earth magnets to recover more fine iron contamination and reduce product wash-off.